Curious? Have good attention to detail? Want to help others? Intrigued about how drugs can alter and affect peoples’ lives? Pharmacy is a health field in high demand growing at a rate of 21% in the next 10 years. With a median salary of $113,390, pharmacy is more than just dispensing drugs. From assessing what types of drugs are best suited for an individual to determining side effects to filling medications, it’s no wonder that pharmacists are a crucial role in patient care. Work environment for a pharmacist is typically 40 hours per week on days, nights, or weekends. Generally pharmacists will check prescriptions, assess medications, update records, dispense medications, advise doctors, nurses, and patients, as well as monitor effectiveness of drugs, doses, and routines. Education revolves around classes with a wide range of biology, chemistry, physics, and mathematics. In the United States Pharmacists are required to earn a Pharm.D. degree and also become licensed by passing examinations including one or two year residency programs. Personality skills that are key for pharmacists include being detail-oriented, good communication skills, highly motivated, and responsible. Similar careers to pharmacy are anesthesiologists, physician assistants, and clinical laboratory technicians. Human memories are not perfect. While we often place a lot of emphasis on the forgetfulness of our memories, we tend to overlook the significance of false memories. False memories are either distortions of past experiences or creations of new ones. While most false memories are fairly harmless, some can have serious implications. They tend to play a huge role in court especially in criminal trials through false recall or false identification of suspects. Recently, researchers at MIT have been able to actually implant false memories in mice through optogenetics. Mice were first placed in a blue environment that was harmless. When they were transferred to a red environment, they received mild foot shocks every time they recalled the first environment. Eventually, when they were placed in the first environment again, they showed signs of fear even though the blue environment was harmless, indicating that they had formed false memories of the first environment. One of the most remarkable things they discovered was that mice recalled fake memories using the exact same processes that they use to recall real memories. Even though mice are simple creatures, their brain structure and processes are very similar to human ones. With this in mind, further neuroscience research with mice can be performed to better understand how our brains change with experience. One day, we can even apply these findings to neurological diseases such as schizophrenia. By learning more about false memories, hopefully, one day, we can learn the difference between true and false recall and save the innocent suspects from a life in prison. The topic of end-of-life palliative care has been on the rise lately. Surgeon and writer Atul Gawande recently came out with a book on the subject entitled Being Mortal. Hearing Mr. Gawande being interviewed about his book on the radio recently, I remembered another story I had heard on the radio: Nancy Updike’s piece on This American Life about her experience visiting her Mother’s husband in his last days in hospice. Her story had more hope, and touched on a number of methods used by the nurses and physicians at the facility that made family members looking after loved ones at the end of their life feel at least a little bit better. My own experience with the topic comes from watching as my father travelled back and forth from Michigan to Hyderabad, India, trying to take as best care of his parents that he could in their last few months of life. The experience was grueling and exhausting, physically and emotionally. In the next few posts, I will explore what the phrase “end of life care” means. Does it mean moving your loved ones to a hospice, far from invasive and potentially medical procedures? Is it the work of social workers adept at handing end of life situations and the politics involved? Is it physicians being sensitive to the needs of the family as well as the patient? I want to look at a part of medicine that is, understandably, difficult to talk about. But I think it’s an area of medicine that should be discussed more in order to do what medicine, in my opinion, is supposed to do: bring some hope to a seemingly hopeless situation. Currently, more than 350 million people suffer from type 2 diabetes. This means that one in twelve in the adult population will experience complications that could lead to blindness and cancer. Soon, thanks to researchers at the Imperial College in London, people suffering from type 2 diabetes melititus will no longer need to prick their finger multiple times per day. Not only will this method reduce physical pain to patients but more importantly, complications such as hypoglycemia and cardiovascular disease will be drastically reduced. A member of the team from the medical department at Imperial London College, Dr. David Hodson states, “It should also reduce complications by targeting drug activity to where it’s needed, in the pancreas”. So how exactly does this miracle drug called sulphonylurea work? A specific modification was made to sulfonylureas that caused it to become photoswitchable- meaning that shining a blue light will enable the release of the insulin and then turning off the light will block the activity that was initiated. By turning on blue LED lights attached to the skin, the shape of the sulphonylurea will change and activate the target tissue and control the blood sugar levels. Elevating the circulating insulin is extremely beneficial because as Hodson stated, targeting vital tissues to improve the uptake of glucose is much better than forcing tissues to consume glucose that it doesn’t really need. This medical breakthrough is extremely exiting and I look forward to the positive changes it will have on the millions affected by melitutus. Have you ever wished that your life could be like a movie? Well, I’m not sure how many of you have been keeping tabs on improvements in the tech world, but that dream is one step closer to being the real deal. Introducing: Smart Bandages. The problem with how major wounds were bandaged is that these bandages had to be removed often to check the status of healing. While neglecting to monitor the wounds allows for infections to go untreated, constantly exposing it by removing the bandages could also expose the wound to infection or disrupt the healing process. But now these Smart Bandages are popping up all over the world. Some researchers in Germany and South Korea have developed these liquid bandages that are supposedly able to track the oxygen concentrations in the skin in wounds and burns. Others in Taiwan are developing Bioscope, which is a system that wirelessly transmits a patient’s heart rate, movement, and bodily noises to a computer. The incredible thing about the Bioscope system is that it is said to include a contact thermometer that gauges temperature, an accelerometer that monitors physical movement and a contact microphone that picks up on sound patterns from internal organs. The University of Rochester is developing bandages that change color to specify that there is an infection present, and even shows where exactly the infection is emerging. They’ve done this with the help of a thin sensor made of crystalline silicon, and layers of porous silicon that has been treated with a liquid that contains probe molecules engineered to bind to fat molecules found on the surface of specific bacteria. The idea behind these bandages could be applied to poison detection or as warnings for possible acts of biological warfare. These bandages will open up so many avenues into safety, detection, and protection that I think they might actually have a significant effect on death tolls on a global level. Welcome to What’s in my…?, where Mary takes a look at the mineral resources that go into the stuff we use every day! This month we’re checking out laptops, starting with the namesake of America’s favorite tech revolution: silicon. Silicon is used in MICROELECTRONICS, aka super-small electronic components, aka microchips. Microchips are tiny little devices that we use in our computers, and they come in several forms, including microprocessors (logic chips that perform computations) and memory chips (which store information, duh). Silicon is great for microchips because it’s a semiconductor, which means that it can be “doped” (the real name for a process where impurities are introduced into the pure silicon) to make it more conductive, making it easy to shape the electrical current within the electronic device. Although silicon makes up 27.7% of the earth’s crust and sand may seem like a renewable resource, sand mining has several concerning environmental impacts. Aqueous sand mining (like in Maharashtra and Goa, India) disrupts the natural course of rivers, allowing the intrusion of salt water during tidal rises and leading to erosion and habitat destruction. In the past few years there has been a movement to put more environmental regulations on sand mining in India to protect fisheries and properties from erosion, especially because much of the mining is done illegally on public or protected lands. Many of those miners are former fishermen in an area where fisheries have already been decimated, and who rely on the high demand for sand mining to make a living. 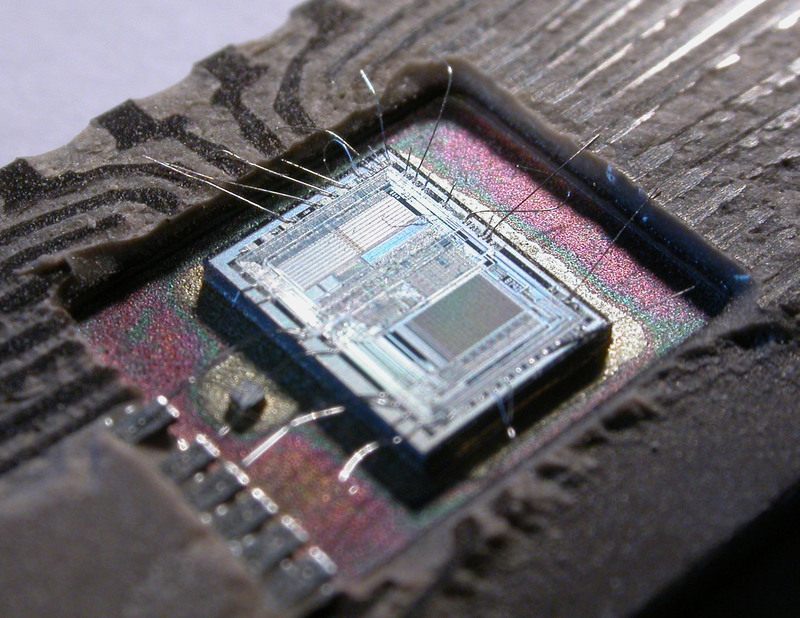 After being mined, sand is transformed into microchips in fabrication plants known as “fabs.” In the fab, sand is melted down into 99.9999% pure silicon and etched into to create a complex integrated circuit. After that, aluminum or another conducting metal is added, and the chip is tested and shipped off to be embedded in our laptops or pacemakers or ATM machines. As microchips are embedded in everything from running shoes to fishing reels, the demand for silicon will only rise over the next few decades. Hopefully, the same spirit of technological advancement that is promoting the use of microchips will encourage the advancement of more sustainable environmental practices in areas where silicon is sourced and mined. Have you ever thought about what happens to medical care during wars? In poor countries how will people get the medical care they need? When civil war broke out in Somalia in 1991 and thousands were in need of medical care one very brave and smart woman stood up to help during this crisis. This woman is Dr. Hawa Abdi. Dr. Abdi was one of the first gynecologists in Somalia, opening her clinic in 1983. Her clinic was small, but she helped out many women in the area by providing medical care to them and reducing the risk of pregnancy complications. This was already a big accomplishment because women in Somalia do not have many rights, but when civil war broke out she would go on to accomplish so much more. Dr. Abdi helped out the entire community with her presence reaching far more women and larger areas than it had before. She not only built a hospital to treat all of these women and other people in need, but also opened a refugee camp and a school, all of which are provided for free to people who need it. Now she was not only acting as a gynecologist, but also a primary doctor and even a surgeon. When Dr. Abdi's two daughters became of age, they both chose to attend medical school and join her in running this operation. Dr. Hawa Abdi is an amazing woman and still runs these operations today. She has written a memoir about her experiences titled "Keeping Hope Alive" and there is also a nonprofit organization today to help her in her mission titled the Dr. Hawa Abdi Foundation. Dr. Hawa Abdi is a strong woman and is capable of doing anything she puts her mind to. She is a Nobel Peace Prize nominee and is an overall amazing woman in science. Is Marvel's Daredevil Really That Far-Fetched? Strangely enough, no! The Marvel superhero Daredevil gained his powers when a barrel full of a radioactive chemical fell off an oncoming truck and struck him, simultaneously blinding him and giving his other senses a superhuman boost. Some parts of the comic are completely fiction, like his blindness from radioactive exposure heightening his other senses immediately. But the “radar” component that allows him to avoid stumbling over obstacles has merit. Numerous studies have been conducted on individuals who became blind due to a brain injury to their visual cortex. The visual cortex perceives the data the eyes deliver to tell you what you are looking at. If this area is damaged, cortical blindness can occur in which your eyes still work, but you are unable to see consciously. The word “consciously” is used here because it turns out that a type of vision is still possible, called “blindsight”. People with blindsight can detect and avoid obstacles in much the same way Daredevil does in the comics. The video clip below shows one such study in which the experimenter told a cortically blind man that they were going for a walk down a hallway. The man had never been in the hallway before and had no idea that there were any obstacles. Yet, he was able to navigate the hallway without realizing he was making any special maneuvers. The secret to blindsight is a part of the brain called the superior colliculus, located in the midbrain. It is usually overshadowed by the visual cortex, but can still retrieve visual information from the retina, creating the blindsight phenomena. While Daredevil himself could not possess blindsight because his blindness resulted from damage to his eyes, the underlying concept of blind people “seeing” is well founded. Welcome to the UMichigan Scientista Events Calendar for the month of October! To register or learn more about an upcoming event, executive board or mass meeting, please e-mail the UMichigan Executive Board at umichigan@scientistafoundation.com. If you would like to receive a weekly e-mail with the Chapter's upcoming events, click here to subscribe! Thank you to all the Scientistas who have applied for the position of UMichigan Scientista Freshman Representative for the Class of 2018. We are currently reviewing applications and will contact you if we need additional information. The UMichigan Executive Board will finish the review process* in the next 2-3 weeks with final selection of the Freshman Representatives by November 2014. *You will be notified in October if you have been invited to interview. Invitations to interview go out in cycles. Some invitations have gone out now. We will continue to extend interview invitations after the university Fall Study Break until the end of October.